This blog is a bit longer than usual but with good reason! Something wonderful is happening all over the United States now through December 7, and I have the joy of being part of it, thanks to Anni Matsick, my illustrator for our Starbird Ridge story series that has been running in Pockets Magazine (www.pockets.org) for the past two years. Anni is one of 200 children’s illustrators who has joined Robert’s Snow: for Cancer’s Cure. She’s transformed a five-inch wooden snowflake into an original piece of art, and Hooray! 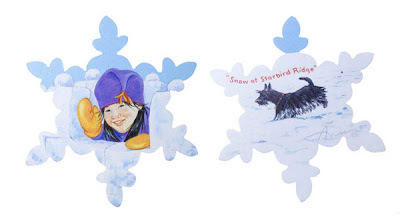 She chose two of my favorite characters from the Starbird Ridge series to put on the snowflake: mischievous Annie–no relation to Anni, the illustrator 🙂 –and Haggis, Annie’s feisty Scottish terrier. The snowflakes are now on display in the Children’s Gallery at the Danforth Museum of Art in Framingham, Massachusetts. They’ll be auctioned off online to benefit sarcoma research at the Dana-Farber Cancer Institute during three online auctions, on Nov. 19 – 23, Nov. 26 – 30 and Dec. 3 – 7. You can preview the snowflakes online (and if you’d like, place a bid) by going to www.robertssnow.com. In our great excitement at being part of this event, Anni and I decided to do an interview to post here on my blog. Here it is below, along with a picture of Anni Matsick and the snowflake she has designed for the auction. I’m asking the questions, and Anni is answering. Why did you choose Annie for the snowflake? As you mentioned, we’re into writing and illustrating the third year of Starbird Ridge. Does any particular episode stand out in your recollection? Yes, the ones where you made me work hard researching things mentioned in the story! I had to find visual references for bear bells, flame flowers, an Ethiopian cocoa pot, and many more things that figured in the plots. That’s how you and I got to know each other, through the email exchanges. Chris Schechner (Pockets art director) and I always laugh about having to contact Peggy again when we are stumped. We always agree that’s what makes your stories so special, introducing new, interesting things to your readers. I have to admit, Anni—I do get a kick out of throwing in those little unusual details, and I smile when I see you figuring out ways to picture those in the series. I’m wondering though–Do you ever get tired of showing the same characters? People asked me that when I did Goofus and Gallant for Highlights Magazine over a nine year period. The characters seem very real to me after a while so it becomes easier to portray their postures and emotions. There are quite a few characters in Starbird Ridge so enough variety exists to keep me interested. As a closet artist/illustrator myself, I’m curious. What medium did you use? Could you describe your process for us? I had to buy a new set of acrylics since I haven’t used them since college. My work for publishing is in watercolor. I practiced a bit on a piece of gessoed cardboard. The snowflake has two layers of gesso which I sanded for a nice, smooth surface. My composition was worked out in a sketch on tracing paper in reverse, so that when I rubbed it the pencil lines transferred to the snowflake surface. I began with light washes of color, diluting the acrylic paint with water, to lay in the palette. After that, I used the paint full strength to develop the image in small brush strokes. The facial expression is always the first thing to establish, then I work around it. I kind of loosened up on Haggis, with the snow on his coat. Once the paintings dried I applied quite a few light coats of spray varnish to seal the image and create an even surface that I think enhances the work. And I know readers may want to know this as well—could you tell us your background and professional experience? My degree in painting from Carnegie Mellon University in Pittsburgh gave me a strong foundation in drawing and a valuable aesthetic sense. I’ve worked for close to twenty years in children’s illustration. Looking at the snowflake you designed, and seeing how natural Annie and Haggis look on this snowy day, I have to ask you–Do you live in a place where it snows? My home is in a college town in central Pennsylvania so I am very familiar with snowy winters! Snow has been lucky for me, since I acquired my reps Cornell & McCarthy when they saw an image depicting children making snow angels in an ad directory. It was one of my first covers for Pockets, which has been a great association over the years. I recall the debut issue of Starbird Ridge had a snow scene on the cover done by you! Yes, and the winning bidder will get a signed copy as a bonus. Anni, I’m so excited about this project, and so honored that you chose two of our Starbird Ridge characters for this worthy cause. Thanks for sharing with my blog readers some of your story. It will be fun to update everyone after the auction is over. I’m excited about participating too, Peggy, and having two charming characters to make the snowflake special. It will be fun to watch the bidding! And a final note to all of you: Remember, you can preview the snowflakes online (and if you’d like, place a bid) by going to www.robertssnow.com . Anni’s snowflake will be in Auction One, November 19-23. Click on any of the artists’ names on the list at bottom to go to each blog. I love reading about an artist's process, since I'm a wannabe with no talent myself! Yay - good to see Anni's art and get a glimpse into her life. She is such a treasure. Great dimension in the ice castle! Such a playful spirit conveyed. I love those snowflakes! You must be very excited about this! I wish it were easier to leave comments on each other's blogs! You have a blog!!!!! Hi Peggy!, Yay for Robert's Snow and for cancer cures! I'm on board for that. I'm now a regular reader. p.s. We need to have lunch. What a great post! Thank you for interviewing Anni and telling us all about the snowflake - it's terrific. Love you, Peggy!